The fizzy carbonation of Diet Pepsi makes it an appealing addition to your diet. Unlike traditional Pepsi, which contains calories from sugar, Diet Pepsi is a calorie-free choice, which is available in caffeine or caffeine-free configurations. Although Diet Pepsi is a calorie-free beverage, it should not be your only drink while losing weight. Diet Pepsi is made by PepsiCo Corporation, and contains zero carbohydrates and zero calories. An 8-oz. serving of Diet Pepsi has 25 mg of sodium, water, coloring, caffeine, flavorings, 118 mg of aspartame, 20 mg of potassium and other ingredients for freshness. The aspartame in Diet Pepsi contains phenylalanine, which people with the rare disease, phenylketonuria, must not consume, according to the the U.S. Food and Drug Administration. None of the ingredients in Diet Pepsi will cause you to lose weight, but the zero calorie nature of Diet Pepsi may benefit your weight loss efforts. If you reduce the number of liquid calories you consume, you may lose weight, according to a study published in the May 2009 issue of the "American Journal of Clinical Nutrition." When you avoid consuming a large percentage of your calories from liquids, such as full-calorie colas or juices, you may lose weight from reducing your overall caloric intake. If you drink 300 calories a day from full-calorie Pepsi, the calories account for more than 21 percent of your diet, assuming you consume 1,400-calories a day. An 8-oz. 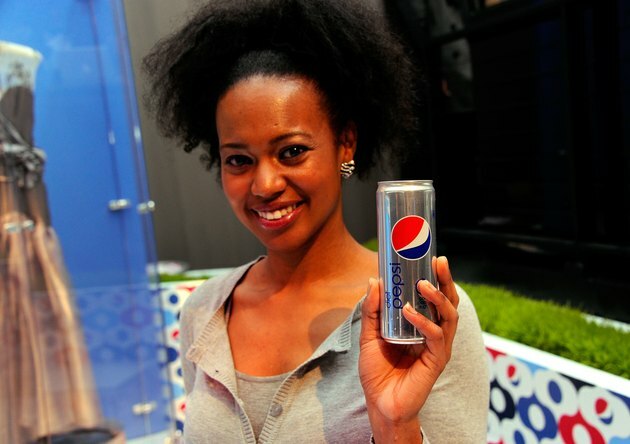 serving of regular Pepsi has 100 calories. Drinking fewer sugary sodas can help you avoid consuming "empty calories," according to Joanne Larsen, registered dietitian. Refined sugar is an unnecessary calorie, but because Diet Pepsi uses artificial sweeteners, you avoid the sugar present in regularly sweetened carbonated beverages. While the common sweetener aspartame contains no calories in a 1 tsp. serving, 1 tsp. sugar has 16 calories. Additionally, the standard formula of Pepsi contains high-fructose corn syrup, which the Dietary Guidelines for Americans recommends limiting. While Diet Pepsi may have benefits in terms of reduced calories and no refined sugars, the Northern Manhattan Study, presented at the 2011 Conference for the American Stroke Association, concluded that drinking diet soda may raise the risk of stroke. Additionally, a publication from the Harvard School of Public Health indicates that drinking diet soda may not help weight loss, but may be detrimental to weight-loss efforts in the long term. This phenomenon may be because of process your body undertakes to metabolize the artificial sweetener. Diet Pepsi may not hurt your weight-loss efforts in the short-term, but drinking Diet Pepsi will not guarantee you lose weight. If you decide to drink Diet Pepsi, use the drink as an occasional addition to your diet and not your most commonly consumed beverage. Drink water with the majority of your meals, and monitor your Diet Pepsi intake to stay within your desired level. What Soft Drinks Have Sodium Benzoate E211 in Them?